The PQCrypto 2016 grant program provides stipends to assist with travel and accommodation expenses the full-time students or postdoctoral scientists who will attend at PQCrypto 2016. The application deadline is January 8, 2016. Notifications will be sent to eligible applicants on January 18, 2016. Please read the rest of this page carefully: It contains important information regarding the grant application procedure and deadlines. Complete the online grant application form. Your Statement is the most important part of your application: it should describe your current research projects, their relation to the topics of this conference, the importance of your accepted contribution, and how attending this conference will help your research career. 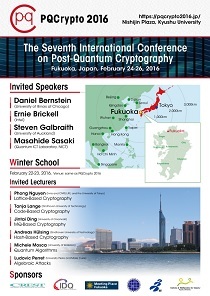 Ask your supervisor to email a recommendation to PQCrypto2016 Conference Secretariat (pqcrypto2016@conferenceservice.jp). The supervisor is required to send the email from the working email address, i.e., that specifying the affiliation, not the free e-mail service (such as Gmail or Yahoo). The applicant must complete his/her conference registration by the grant application deadline. Submit a copy of your student ID: fax it to +81-92-510-7084 or send a digital copy to PQCrypto2016 Conference Secretariat as an e-mail attachment. Please state on the fax or on the head of the letter: "A grant applicant to PQCrypto 2016". All materials must arrive at PQCrypto 2016 Conference Secretariat on or before the application deadline. Late applications and materials will not be considered. The number of available grants is limited. Eligible applicants will be determined based on the quality of the paper submission and the statement. If you have any questions or need further information, please contact the PQCrypto2016 Conference Secretariat(pqcrypto2016@conferenceservice.jp).